Artist Ronnie Olsthoorn did absolutely sterling work on the profiles for 'Ki-44 Tojo Aces' but the publishing size constraints for the Osprey series meant that a lot of wonderful detail was lost or reduced in the final printed versions in the book. Ronnie has kindly given permission to show some larger size examples here, together with some of the full size details from the profiles. 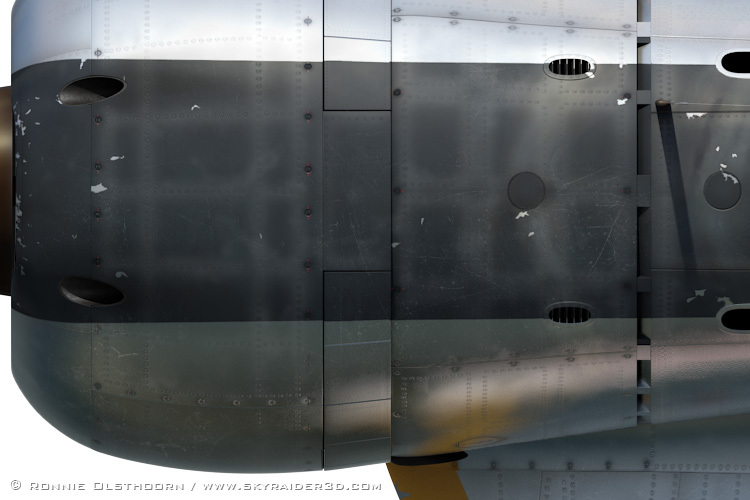 He is now very busy working on the 3D model and profiles for 'Ki-27 Aces' with a surprise in store for the cover art. 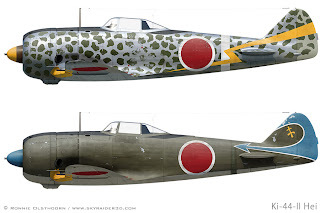 The heading image shows (top) an 85th Sentai machine reportedly flown by ace Capt Yukiyoshi Wakamatsu and one of the Burma based 64th Sentai aircraft with 4th Chutai tail insignia. 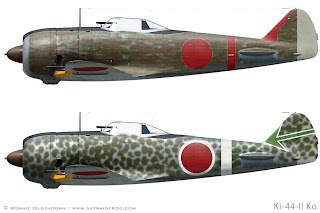 Pre-production Ki-44 (5th prototype) of Maj Toshio Sakagawa of the 47th Dokuritsu Hiko Chutai, Saigon, December 1941 and (lower) Ki-44-I of Akeno Flying School painted to play the part of an RAF 'Buffalo' in the Toho 1943 film 'Kato Hayabusa Sentôtai' and flown by future 68th Sentai ace Lt Hiroshi Sekiguchi. 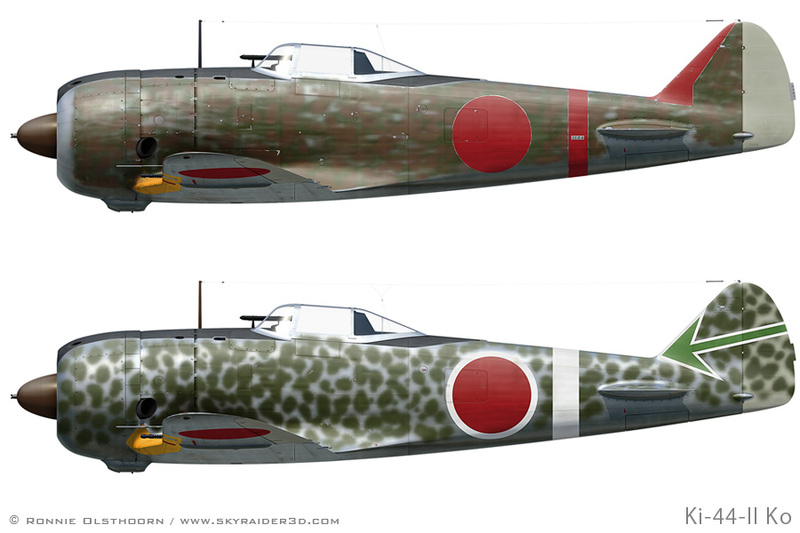 Ki-44-II Otsu of the 87th Sentai, Meiktila Burma in May 1944 and (lower) Ki-44-II Otsu of 3rd Chutai, 70th Sentai at Anshan, Manchuria in August 1944. Ki-44-II Hei of the 50th Sentai at Meiktila, Burma in late 1943 and (lower) Ki-44-II Hei of the Sentai Hombu, 29th Sentai, Clark Field, Philippines, November 1944. 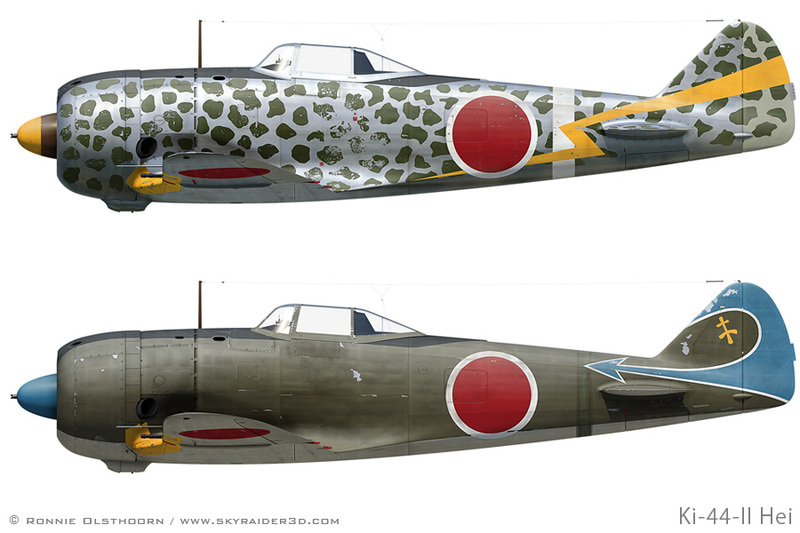 The hard-edged camouflage blotches on the 50th Sentai aircraft are replicated from a photograph. The 29th Sentai example is in the late war factory applied scheme of JAAF # 7 Ohryoku nana go shoku (黄緑七号色 - yellow green no.7 colour), an olive brown paint similar to US Olive Drab. 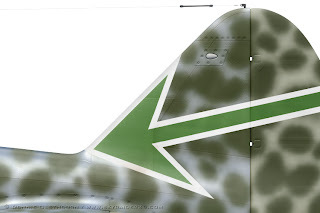 Under surfaces are painted JAAF # 1 Hairyokushoku (灰緑色 ash green colour). The senchi hiyoshiki - white so-called 'combat stripe' (literally war front sign) - appears to have been painted out on this machine. 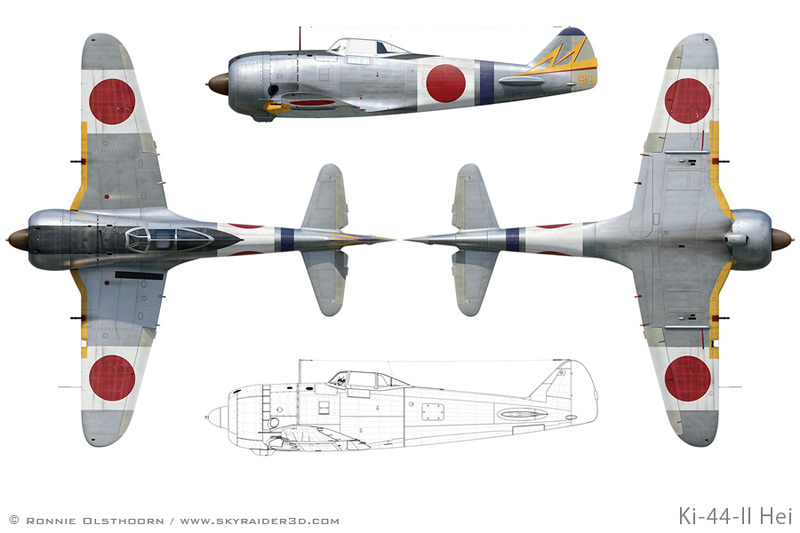 Three view of Ki-44-II Hei of Capt Teiichi Hitano, 3rd Chutai/Hikotai and 'Sakura' leader, 47th Sentai, Narimasu, Japan, early 1944. Detail of tail fin, rudder and insignia of 64th Sentai example. The camouflage pattern is carefully replicated from a rare photograph of this aircraft. 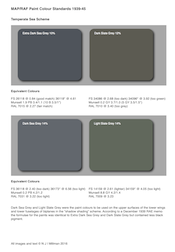 Typical paint colour was JAAF # 21 midori iro - (緑色 green colour) a deep olive green of strong chroma. Detail of the cowling of the 70th Sentai example. 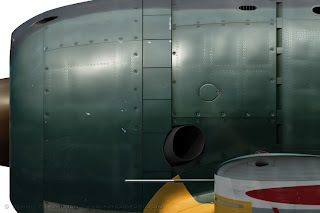 The paint colour is depicted as the dark blue green JAAF # 27 (青緑色 ao midori iro) and the lustre is replicated from photographs of the actual aircraft. 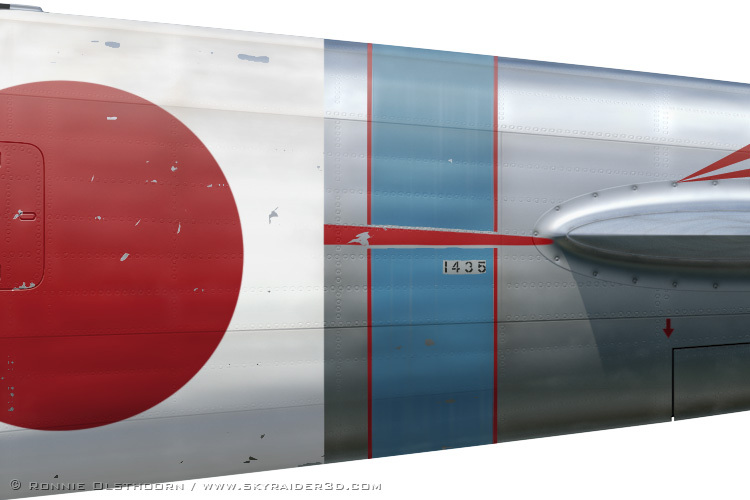 Close up detail of the fuselage markings and serial presentation on Capt Jun Shimizu's 47th Sentai Ki-44-II Otsu with 40mm wing armament. 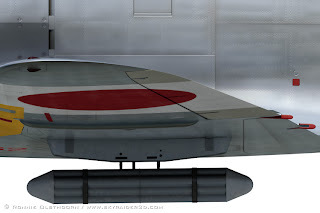 Detail of the Ta-dan air-to-air cluster bombs carried under the wings of Capt Yasuro Masazaki's 2nd Chutai, 47th Sentai Ki-44-II Hei and replicated from a photograph of the actual aircraft with this ordnance. Ronnie went to great pains to get the stencil detail correct - note red-painted retractable step, flap guides and marking under wing. Top view of the cowling anti-glare panel on Capt Hitano's 47th Sentai aircraft. 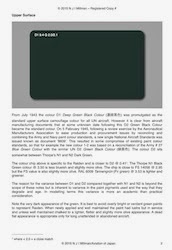 The colour is a deep blueish-black, JAAF # 32 Koku Ran Shoku (黒藍色 black indigo colour). As I have shared with you via e-mail, I feel that Ronnie's profiles in this book are the best I've seen, bar none. It helps that the subject matter is near and dear to my heart, but they are superb. Thanks for sharing the larger images here! Thanks for putting these profiles on the blog, they are superb! I hope to see much more of Ronnies artwork in the near future. 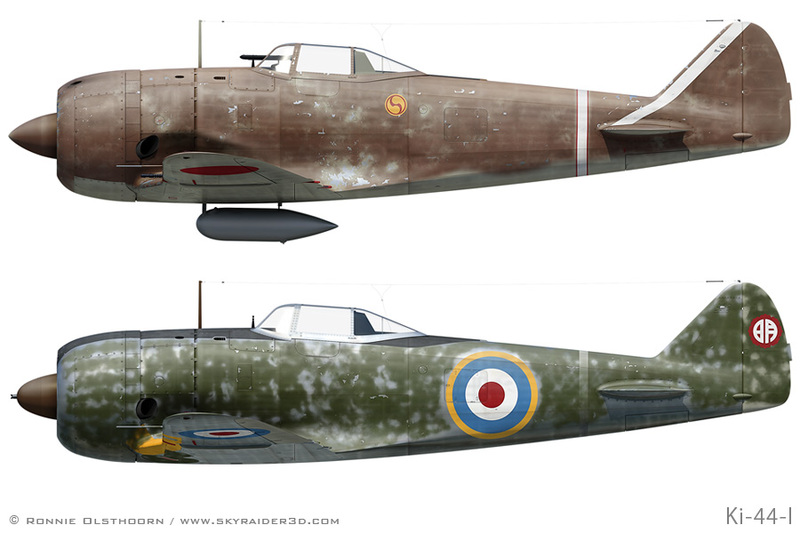 Thank you so much for posting Ronnie's superb Ki-44 artwork. These profiles raise the bar and as Dan said, they are the best ever to grace a book from that publisher. Superb job all-round on the book, especially considering the constraints of the format, it really pushed the envelope for what can be conveyed in this series. I really enjoyed it, and look forward to the Nate book just as much. Great profiles, my hats off to Ron. Nick when you say 64th Sentai 4th Chutai are your referring to the headquarters Chutai? I have always seen other HQ Chutais shown as blue (sucdh as the 29th). This would be the first time I have seen one depicted in a shade of green. Thanks for the link to your review and thanks for the review! No, 4th Chutai means 4th Chutai! The term "HQ Chutai" is something of a misnomer perpetuated by old references. The Sentai Hombu (HQ) usually only deployed a Shotai (flight) of 3-4 aircraft but often the Sentai Hombu staff (if they were pilots) flew with the other Chutai. 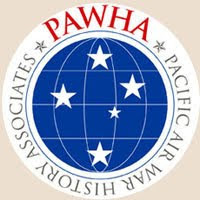 It was not unusual for the Sentai CO and his Exec or Adjutant to have wingmen appointed from the other Chutai, especially mission specific, although the practices varied from unit to unit and over time. 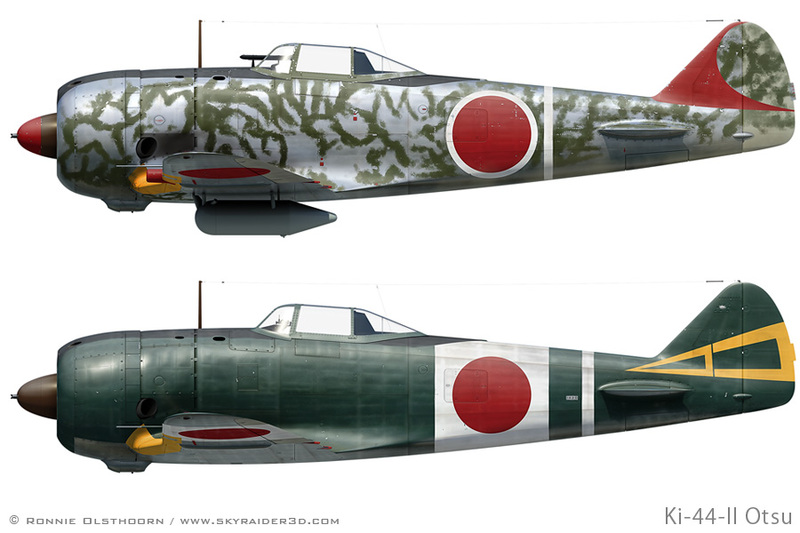 You are correct that Sentai Hombu aircraft usually had blue markings but the usual colour for a 4th Chutai (when formed) was green. Thanks for the clarification Nick. 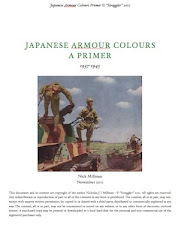 I have been reading about WWII Japanese aviation on the internet and in a few books for 4 years now and this is the first I have ever heard of a 4th Chutai. And yes, I do intend to buy the book. I tried your link to Amazon and couldn't sign in to my account. Then I realized it was Amazon UK. Oops! But I found it here in the good ole' US of A and will be getting it when my tax refund comes in. just picked this book up. Top job as they say. 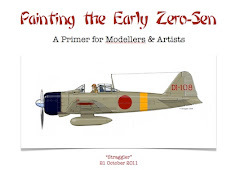 Means I can get my hasegawa one done now. 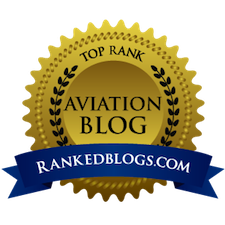 Thanks very much for the kind comments!